Employees that spend time on social networks during work hours are costing UK firms “more than £130m per day” in lost work time, according to a new and frankly rather one-eyed looking survey. The study, by employment law firm Peninsula, concludes that 233m hours are lost as a result of social network use and that employers need to take action. The figures, based on interviews with 3,500 UK employers, suggest some employees are spending two hours per day on social networks. Quite how employers were able to estimate the figures is unclear but, based on the fact that there are roughly 30m people working in the UK, then £130m per day equates to around £4.30 per hour per employee – less than an hour’s work for most people. That should also be offset against the fact that more and more professionals are now using social networks for business reasons - some to share advice, others to make connections. It is also similar to a report we covered last year, in which the Employment Law Advisory Service (ELAS) estimated that £7bn was being lost by employers as a result of workers doing their Christmas shopping online. Reports like this fail to account for all the extra ‘free’ overtime which many UK employees often work – staying late or working through lunch breaks to get tasks finished. Indeed, Eurest’s 2006 Lunchtime Report found that the average lunch break for British workers was just 28 minutes, and that one in five workers either miss their break or eat at their desk because they are too busy. Yahoo! is reportedly testing a new professional social networking service that connects students with prospective employers. Called Yahoo! 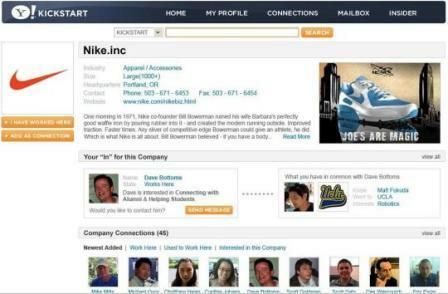 Kickstart but still merely a concept, the site focuses around users’ CVs in the style of LinkedIn. It also offers companies the opportunity to create groups that students can join. 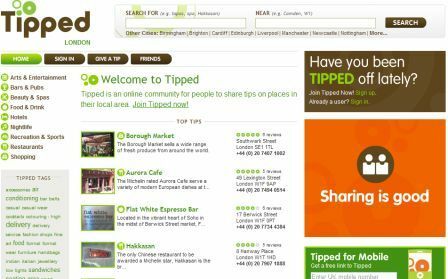 Tipped, a new site launched last week, provides people with the chance to view and share tips on the best places in their local areas, from bars and restaurants to shops and hotels. Social network Facebook is planning to allow users to make their profiles on the website searchable by the public and enable search engines to index its members’ listings. Facebook will notify its members of the move today, allowing them to choose whether or not they want their basic profile listings to be made public. Outsiders will only be able to view the name and public profile picture, it says.